The goal of the Chemistry around us exposition is to show chemistry in a context of which many of us are not aware. Many items that we handle every day, many processes that we take for granted, were born in a chemist's workshop, in test tubes, and in developmental, technological and industrial laboratories. The exposition also presents noteworthy pioneers in the field of chemistry, like the work of noted Czech chemist Jaroslav Heyrovský, who received the 1959 Nobel prize for polarography, and the work of Otto Wichterle, whose invention of soft contact lenses was a world-changing event. Visitors may see Otto's original design equipment, built from a Merkur children's construction set. Another significant element presented in the exposition is the phenomenon of the chemical laboratory. Visitors may take a glimpse into the past – part of the exhibit is an alchemist's shop and old chemist's laboratory. 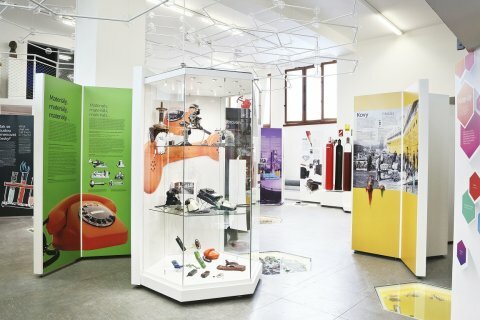 As part of the special programs associated with the exhibit, it will be possible for visitors to see an actual professional laboratory of the National Technical Museum, equipped with the most modern technology, and acquaint themselves with analytical techniques used in investigation of our current museum collection objects. "History of Contact Lenses” exhibition has become a new part of permanent exhibition Chemistry Around Us. This new exhibition presents history of evolving contact lenses and introduces to visitors the achievements of great scientist Otto Wichterle, who is the inventor of suitable soft contact lenses production material and also the inventor of the way how to produce soft contact lenses. The visitors have great opportunity to see one of the first “contact lenses maker machine” – “čočkostroj” from 1961, the phial containing part of the first million casted contacts lenses, casting plate for preparing prefabricates for contact lenses production by turning them on lathes and many other machines and kinds of contact lenses from different periods. The working model of “contact lenses maker machine” made from Merkur building kit is also part of the exhibition. The model is made by Merkur building kit collector Jiří Mládek.